We are pleased to announce that we are partnering with South Peachtree Creek Nature Preserves, Inc to raise money for the Clyde Shepherd Nature Preserve (CSNP) in the Medlock Neighborhood, north of Decatur. 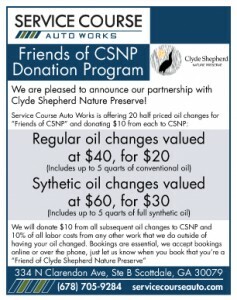 We’ll be offering 20 half priced oil changes for “Friends of CSNP” and donating $10 from each of those oil changes to CSNP. In addition to the discount oil changes and subsequent donations, we will also be donating 10% of all labor costs from any other work that we do for “Friends of CSNP” to the organization. Clyde Shepherd Nature Preserve is a protected area located in the Medlock Park neighborhood of DeKalb County. The 28-acre nature preserve opened in 1995 under the management of South Peachtree Creek Nature Preserves, Inc., (SPCNP) a non-profit, neighborhood organization with the goal of preserving natural spaces in the South Peachtree Creek watershed. SPCNP Inc. maintains the property for the protection of wildlife habitat and the enjoyment of our neighbors and other visitors.